Dynamical Systems Method for Solving Nonlinear Operator Equations is of interest to graduate students in functional analysis, numerical analysis, and ill-posed and inverse problems especially. 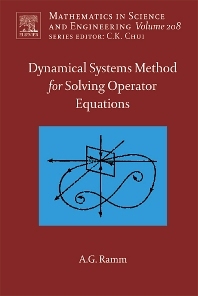 The book presents a general method for solving operator equations, especially nonlinear and ill-posed. It requires a fairly modest background and is essentially self-contained. All the results are proved in the book, and some of the background material is also included. The results presented are mostly obtained by the author.